"Bad boys" Oasis have been forced to cancel upcoming gigs in Beijing and Shanghai after Chinese authorities revoked the band's performance licenses. The band have been deemed "unsuitable" to play during the People's Republic of China's 60th anniversary year, due to their association with the Tibetan freedom movement. Oasis were told of the decision on February 28th, that their first-ever Chinese concerts would be cancelled. They were due to play at Beijing's Capital Arena on 3 April and Shanghai's Grand Stage on 5 April. Ticket agencies were instructed by authorities to stop selling tickets and to reimburse fans who had already made purchases. The band said in a statement that they had "fully and successfully complied" with licensing and immigration rules and thought that these issues were resolved "well before the shows went on sale". 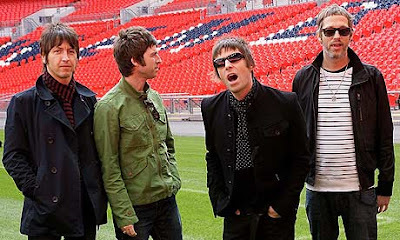 Insiders within the band's management have said that problems arose after Chinese officials discovered that Noel Gallagher had appeared at a Tibetan Freedom concert in 1997 on New York's Randall Island, along with other super stars, such as U2 and Blur . The band is said to be very disappointed with the decision, and hope that they might be able to perform to Chinese fans at some stage in the future. The tour will still continue, with a gig in Hong Kong on 7 April, followed by eight shows in South Korea and Japan. The Chinese government has ramped up scrutiny of western artists, ever since Bjork yelled "Free Tibet!" while on stage in Shanghai last year. Aside from Aussie Pete: It's not really surprising - they were even kicked out of Australia many years ago because of their behaviour. Oh China, when will you learn. I feel bad for all the Chinese that will not get to see this great band live. 5th Of April In Singapore Pete!!! !